In 1844, Philip Cady Van Brocklin opened a factory, P. C. Van Brocklin, in Brantford to make plows and stoves. Van Brocklin, originally from New England and trained as a moulder, moved to Normandale, Ontario in the early 1830s to work in an iron foundry there. In 1848 Van Brocklin was joined by another immigrant from the USA, Charles Horatio Waterous, who brought considerable skill as a machine designer; Waterous took a one-fourth interest in the business and they operated as P. C. Van Brocklin & Co. Within a couple of years Waterous decided that they should make steam engines. He used his American contacts to hire additional millwrights and machinists, including one Thomas W. Hall, who had worked with Waterous at a short-lived predecessor to Shepard Iron Works in Buffalo. Despite not having the benefit of planer or shaper, Van Brocklin & Co. managed to produce a 25 horsepower direct-action engine to power the Van Brocklin & Mead sawmill. This success led to additional orders and the firm invested in machinery to manufacture steam engines. In 1857 Van Brocklin sold his interest in the firm to Waterous and three new partners—Joseph Ganson, Franklin P. Goold, and Adolphus P. Bennett—and the business name changed to Ganson, Waterous & Co.. In 1864 Waterous bought out the last of the partners—Goold—and added a new partner, George H. Wilkes. They renamed the firm to C. H. Waterous & Co., a name that stuck until 1874 when the business converted to a stock company with the name Waterous Engine Works Co., Ltd. In 1877, Wilkes sold his share to Waterous and his family. That same year, the firm bought the rights to manufacture the David June "Champion" engines in Canada. David June also happened to be C. H. Waterous's brother in law. Ad from 1871 "Lovell's Dominion Directory"
By this time, the business was very successful. Their product line included woodworking machinery, steam engines, fire engines, fire hydrants, pumps, and related products. The company had a plant in Winnipeg, MB, which in 1886 relocated to St. Paul, MN, specializing in fire-fighting equipment and fire hydrants. Our best guess is that woodworking machinery was only ever made in Brantford. In 1895 the Brantford operations moved to a large new plant, which was further expanded over the ensuing years. In 1926 the company name was shortened to Waterous, Ltd. By this time the company was starting to develop a successful line of machinery for the pulp and paper industry, which helped replace the now-defunct business for steam engines. The woodworking machinery business was long gone by this time. In 1953 the Brantford business was purchased by the Koehring Co. of Milwaukee, and was renamed to Koehring-Waterous Ltd. (The St. Paul operations, makers of firefighting equipment, continued as the Waterous Co.) The product line was further expanded to include construction equipment—excavators, cranes, rollers, etc.—and concrete batching and mixing equipment. In 1964 the foundry operations were discontinued and replaced with a plant for metal forming and welding. By 1992 the business was the Koehring-Waterous Division of Timberjack, Inc. We have not found any information on the dissolution of Koehring-Waterous, but the business closed sometime between 1996 and the present. Mr. T. W. Hall subsequently went to Buffalo to fill an engagement in the Shepard Iron Works, of which firm C. H. Waterous, Senr., was a member. After working there some time, and Mr. Waterous coming to Brantford, Mr. Hall followed in the spring of 1849, by request of Mr. Waterous bringing his brother Samuel and his stepmother with him. They went from Buffalo to Port Colborne by steamer, and in the latter place met the father of Ignatius Cockshutt. At Port Colborne they took boat on the Grand River,... Mr. Hall and his brother came on to Brantford by way of Cainsville. Thomas soon found employment in the machine shop, and his brother in the foundry, of P. C. VanBrocklin & Co., with which Mr. Waterous, Senr., was connected. Mr. Hall and an apprentice were the only hands in the machine shop for some time. This building stood on the west end of the present brick structure. About two years later Mr. Waterous conceived the idea of building engines there, and a couple of millwrights came from the United States to do the millwright work for VanBrocklin & Mead's saw-mill. The engine and machinery were constructed under great difficulties, the fitting being all done by hand, there being no planer, shaper, or such labour-saving machinery. After considerable labour the mill was started with a "direct-action" 25 horse-power engine for saw-mills, this being the first one in that section of the country. Mr. Wolverton, of Paris, ordered the second one, which was constructed under the same difficulties as the first. The present Waterous Engine Works were then commenced, and this was the starting of the large business in Brantford, and Mr. Hall, who put together and started the first eight engines that were sent out from the shops, probably deserves more than great credit for this success. For some years previous to 1877, Mr.Hall held the position of Superintendent of the works, which he resigned on July 1st of that year, and, retired, having, by industry and economy, amassed considerable property. Waterous Engine Works.—The above establishment was founded in 1844 by P. C. VanBrocklin, who commenced making stoves, and subsequently engaged in the manufacture of threshing machines. In 1849 C. H. Waterous began the manufacture of steam engines and mills, taking a one-fourth interest in the concern. This business was continued until 1857, when, in connection with Messrs. Ganson, Goold and Bennett, he purchased the plant and tools, and commenced operating under the firm name of Ganson, Waterous & Co. In 1864 Mr. Goold, the last of the former partners, withdrew, and Mr. G. H. Wilkes was admitted into the partnership, and the name of the firm changed to C. H. Waterous & Co. Business was continued under this style until 1874, when a stock company was formed under the Limited Liability Act, which operated under the name of the Waterous Engine Works Company, as it is now known. Mr. Waterous is still the general manager of the company, and the stock is all owned by himself and family. The business has increased in a marked degree since 1849; then twenty-five hands were employed, and the annual production amounted to about $30,000; to-day one hundred and eighty men are employed, and work to the value of $285,000 produced annually. The products consist chiefly of agricultural engines, small grist-mills, saw-mills, shingle-mills, &c. The works comprise eight departments, viz. : Finishing, moulding, carpenter, pattern, blacksmithing, erecting, boiler making and painting. The machinery is operated by a forty-horse power engine. The Canadian Album: Men of Canada, by John Castell Hopkins and W. J. Hunter, 1891, has a biography of C. H. Waterous, complete with portrait. A page on the University of Western Ontario website provides a history of this firm that provided the major dates given here. The dates are generally corroborated by other data as given below. Waterous was founded in 1844 as the Waterous Engine Works Co., Ltd., by C. H. Waterous in Brantford, Ontario Canada. The company built steam fire engines and saw mill equipment. A Waterous Engine Works advertisement from 1890 shows the company selling specialized woodworking equipment at that time. Lovell's Canadian Dominion Directory for 1871 lists C. H. Waterous & Co. as proprietors of the Brantford Engine Works, Dalhousie st. The titular Waterous was Charles H.
Canada Farmer for September 30, 1873, has a report on the Twenty-Eighth Annual Exhibition of the Ontario Agricultural and Arts Association. 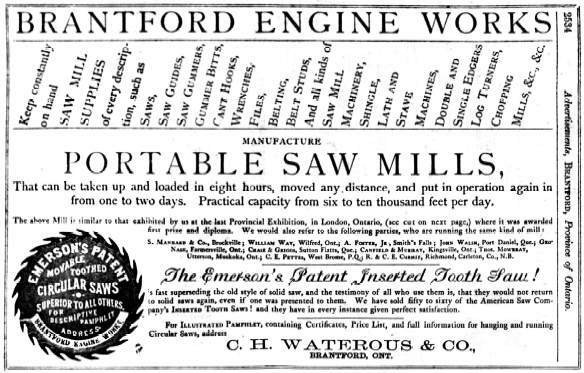 In the section on machinery, it says, "C. H. Waterous & Co., Brantford, have a steam engine driving a saw mill, and lathe and shingle machines, all in full operation. We are informed that the saw mill, engine, and every part of the machinery complete, and capable of cutting from 7,000 to 8,000 feet per day, can be furnished for $2,000." The September 28, 1876 issue of The New York Times carried a multi-page listing of award-winners at the Centennial Exhibition. Waterous Engine Works won for their "Portable Saw Mill". Listed in the Official Catalogue of the United States Centennial Commission : "Waterous Eng. Works Co., Brantford, Ont.—Portable saw mill." A revised-edition "Official Catalogue" has some additional description: "Twenty-five horse power portable saw mill: capacity, six to ten thousand feet per day; shipping weight, eight tons. A strictly portable saw-mill, practical, efficient, economical, and durable; obtained first medal and diploma at Exposition Santiago, Chili, South America, September 1875." The Authorized Catalogue of the First Annual Exhibition of the Agricultural and Industrial Exhibition Association of Toronto , held in September 1879, lists "Waterous Machine Works Company" of Brantford as an exhibitor of a shingle machine. It lists "Waterous Engine Works Company" of Brantford as an exhibitor of a portable engine and boiler, a steam boiler, a "steam engine, common slide valve, 6-horse power and upward, in operation", a portable grist mill, a gang saw and frame, a sawmill dog, and a portable sawmill (in operation). From Sessional Papers, Legislature of the Province of Ontario. "Official list of prizes awarded at the Grand Dominion and Fortieth Provincial Exhibition of the Agriculture and Arts Association of Ontario, held at London, from September 7th to 12th, 1885." Best saw-mill, steam, in operation, Waterous Engine Works Co., Brantford, Silver Medal and $15.00; best shingle and heading machine, $4.00. They also exhibited a "grain cracker". From 1886 ads in The City of Brantford, a promotional book from the publisher of the Brantford Expositor. This firm was described as a maker of "Wood Working Machinery". An 1890 Waterous Engine Works catalog of sawmill machinery is available online. Canadian industry, commerce, and finance; published as a companion volume to The Journal of Commerce , 1916, by J. J. Harpell: Lists Waterous Engine Works., Co., Ltd., Brantford, Ont., as a producer of mining machinery; woodworking machinery; woodworking planers; portable saw mills; band sawing machines; circular sawing machines; saw mill edgers; shaft bearings; pulp beaters; pillow blocks; locomotive boilers; marine boilers; portable boilers; return tubular boilers; stationary boilers; bolsters; smoke boxes; elevator buckets; refuse burners; iron castings; boom, log and saw mill chains; pulp-wood chippers; coupling clutches; condensers; chain and belt conveyors; coal and ash conveyors; sawdust conveyors; spiral conveyors; clutch and cut-off couplings; flanged couplings; brass-lined cylinders; engine cylinders; iron, boiler, and brick kiln doors; stone crusher elevators; hoisting, hauling and winding engines; portable engines; waterworks pumping engines; saw-milling engines (portable or on skids); stationary steam engines; fire appliances; fire department supplies; steam and gasoline fire engines; iron and steel water flumes; cast iron gearing; boiler grate bars; grates and grate baskets; knife grinders; wood pulp grinders; shafting hangers; feed water heaters; coal-handling machinery; mining machinery; pulpwood and pulp machinery; roadmaking machinery; taper mandrels; riveted pipe; iron pulleys; boiler feed pumps; centrifugal pumps; vacuum pumps; fire hose reels and wagons; steam and gas road rollers; saw arbors; saw frames; saw mill carriages; saw sharpeners; saw swages; revolving screens; shafting; portable tanks; steel tanks. The Dictionary of Canadian Biography entry for C. H. Waterous provides a more thorough history of the man. The June 1996 "Logging and Sawmilling Journal mentions a new Koehring Waterous five-disc saw felling head for a feller-buncher. There is a history of Waterous called Iron, Steam and Wood , by Mike Hand, 2000. This self-published book is available through the Brant County Museum gift shop. Steam Power on the American Farm by Reynold M. Wik, 1953 page 254.